The best hashtags involve a good pun or play on an idiom. It keeps things lighthearted and fun—just like your wedding is going to be. If your last name is part of a common phrase or a popular euphemism, go with it. Consider this: #goodknight. Not sure where to start? Check out an idiom website for a little assistance. In fact, it’s better than alright…it’s a really good rule of thumb. #WilsonWedding #MorrisonMarriage, and #HappilyEverHarrison are fun ways to celebrate your nuptials (especially if you’re taking your fiance’s last name). Plus, alliteration makes your hashtag easier to remember. Think about ALL of your names: your first name, your middle name, and any nicknames (that you WANT to share with your guests)! Even consider your initials. You’re not limited to just using your last names or new family name, so mix and match to find the best combination out there. Do you and your fiance call each other honey #HoneyDo is the one for you. Is your last name Bloch? Consider #NewlywedsOnTheBloch. Again, consider all of your available names here. Do any of them rhyme with a “wedding word,” like hitched, love, or I do? If so, you’re all set for a playful hashtag everyone will easily remember. Is your name Cooper but your friends call you Coo? Think about using something like #DeanAndCooSayIDo! To help avoid any potential readability issues, capitalize each word. This will show your guests where each word starts and will prevent any misspellings or awkward misreading. For example, you’d definitely want to consider printing #JenAndIanAlways on your save the-date over #jenandianalways (read it again…). If you’re concerned you may have missed something, have a few friends take a look at your chosen hashtag before you fully commit. When your guests go to use your hashtag, they don’t have to capitalize every word—it will still work the same either way. You want your friends and family to use the hashtag on their photos, so make sure they’ll be able to remember it! If guests are left guessing if a hashtag is #JakeLovesRachel or #RachelLovesJake, they may end up using the wrong hashtag which just makes things harder when you’re trying to look through all the shots your guests snapped throughout the night. 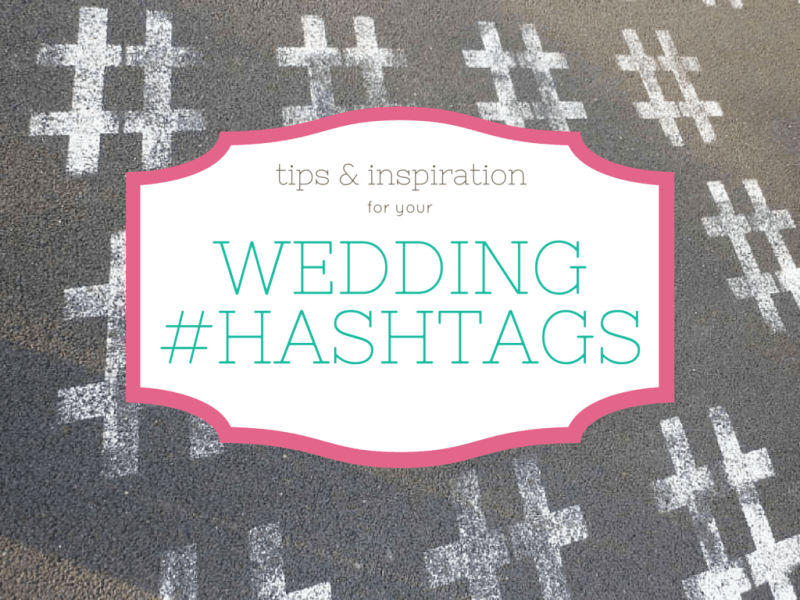 You don’t want to miss any photos of your big day because of a silly hashtag mishap. As soon as you have thought through all the possible hashtag creations and picked “the one,” check to see if it already exists. If someone else used your clever hashtag already, you might want to go back at square one. You don’t really want someone else’s family photos in your collection, do you? The only way for a hashtag to really do its job is if your guests use it. As soon as you’ve decided on a hashtag, make sure you spread the word. And the earlier, the better. You’ll want to launch your wedding hashtag as soon as you get engaged so that all wedding related festivities can be included. Put it on your wedding website, add it to your save-the-date, or tell all your closest friends to include it on their photos from your engagement party, bridal shower, bachelorette party to help get the ball rolling. The day of the wedding, sprinkle tasteful reminders throughout the event. Consider putting signs by the venue’s entrance, including a note on the menu, or a message on the program). Remember that hashtags don’t have to just be about last names. They can be about your theme, wedding date, first names squished together or anything else.